The LM431 is a three-terminal adjustable shunt regulator with specified thermal stability over applicable temperature VREF (Approx. 2.5V) and 40V with two external resistors. 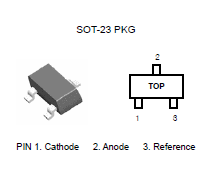 This device has a typical dynamic output impedance of 0.2ohm. Active output circuitry provides a very sharp turn-on characteristic, making this device excellent replacement for zener diodes in many applications. The LM431 is characterized for operation from -40°C to +125°C.